"The Hope Center is the hub of our outreach. It’s also one of our main sources of income to keep our programs running." 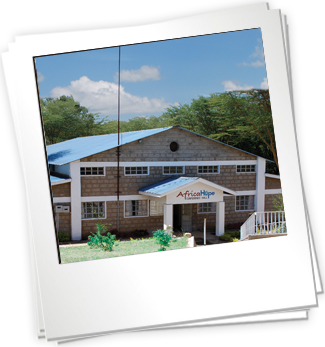 Kenya has a well established Church, and nearly 90% of population call themselves Christians. However, the church in Africa is “a mile wide and an inch deep,” and this generalization applies to much of Kenya. We started AfricaHope because, in addition to the needs of the Church, the Maasai deserve better health for their children, sustainable crops and an opportunity for education. We are committed to spreading the gospel of Jesus Christ and changing lives through truth and hope. We believe there is a Christian response to problems in all areas of life, and we seek to empower people to act out those responses. In partnering with local churches and communities, AfricaHope walks alongside the Maasai. We believe they have many of the answers to the problems their villages and families face. We must allow them to hold to their traditions. We need to see the beauty and uniqueness of how God created them, and learn from the wisdom that God has placed within the Maasai. Then when it becomes evident that additional resources are needed to meet a specific need, AfricaHope steps in to fill the temporary gap. Our purpose statement: AfricaHope, compelled by the Gospel of Christ, is committed to the holistic restoration of rural communities in Narok, Kenya. We do this through local church and community transformation with a focus on leadership development, capacity building and advocacy.